A "unit" is defined as damage not exceeding the surface area of a standard credit card. Used auto parts are a great option when looking for quality discount auto parts for your vehicle. Often you will enjoy significant savings over the cost of new auto parts. Because the parts are recycled, however, sometimes they will have damage. Often this damage is minor and even with the cost of repair, used car parts are a real value for your money. This Damage Code Locator has been provided for your use by the Automotive Recyclers Association (ARA). Many of our auto salvage yards use these codes to indicate damage in their comments or descriptions. 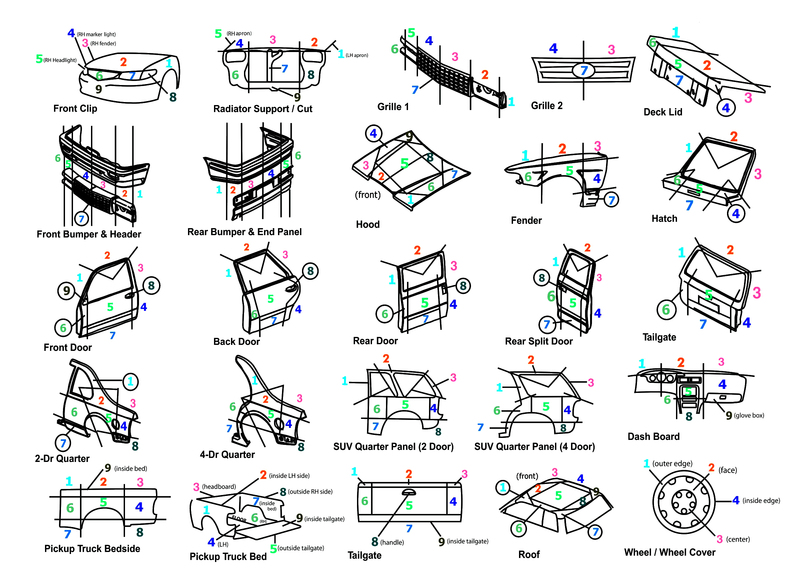 Here's how to read the ARA Damage Codes to determine the amount of damage the used auto parts have. Each code tells you the location of the damage, the type of damage, and the number of hours to repair the damage. Here's an example: Let's say you're looking for a door. A damage code of "5P1" tells you there is a "parking lot ding" in location 2 that should require about 1 hour of repair at a body shop. The used auto parts you see on CarpartsNigeria.com may have more than one damage code. For example: "5P1" "7R2" tells you that in addition to the "parking lot ding" there is "rust" at the bottom of the door that will require about 2 hours of repair at a body shop. Parts with no damage will have a code of 000.
in an "S" pattern for locations of door handles and mirrors. If you are in doubt about the meaning of the comments or descriptions you see on the used car parts on CarpartsNigeria.com, Please contact the auto salvage yards by either phone or email.